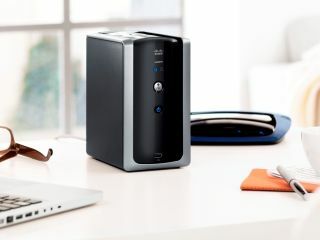 TechRadar has teamed up with Cisco to offer readers a chance to win one of two Linksys by Cisco Media Hubs, worth £269 each. Designed to simplify access to and interaction with digital content, Media Hub gathers, organises, and presents all the digital video, photos and music that users have spread amongst various devices in the home. Easily enabled with just a few clicks of a button, remote access allows users to view, upload and download all of their media through an easy to use interface accessible in the home and throughout the world via ciscomediahub.com. Media Hub is the perfect solution for consumers with extensive digital media libraries who are looking to eliminate the complexity of managing their collections. Sharing media on multiple devices within the home is easy with the Media Hub's media and iTunes server and the device automatically searches the network for other media devices to present all available digital media to the user in a single location. Content accessible to the Media Hub is presented in a browser-based, simple to navigate user interface. Music albums are consolidated and presented together with the appropriate album art, regardless of where the tracks reside within the network, eliminating the need to know which device music is stored on. Photos and videos are presented using thumbnail images that are easily organised by date or name. Automated backup software is also included with the Media Hub to help ensure that all your digital libraries are protected. For further information please go to linksysbycisco.com. This competition is now closed. The winners are Heather Simpson from Fife and Alison Church from Norfolk.